Long serving life: usually 20,000 hours. Fast Reaction Time: About 1-2mins to achieve full power output. High thermal effect: Based on wavelength of 2.6-3.5um, get high thermal energy to 46.6%. Energy Saving: Gold and Ceramic coating maximize reflect Infrared radiation up to 90%, more energy saving, smaller footprint and better heating results. Green, safe and Environment Protecting: nontoxic and peculiar smell, no risk of contamination over environment or target object to be heated. 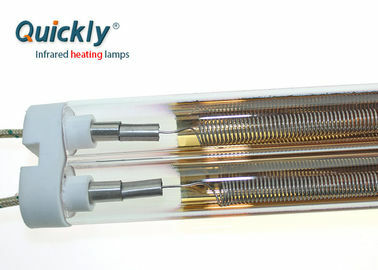 One of the main material for quartz heater lamps is quartz tube, and quartz tube is made up from quartz sand, the tube we use is made by Quartz IOTA - the high purity quartz sand 99.99% Si02, the world’s leading quartz raw material and hydroxy of quartz tube is 1PPM,in this case, our lamps can work at a higher temp like 1000℃. Another main material of quartz lamp is tungsten filament,which is purchased from XIAMEN HONGLU TUNGSTEN MOLYBDENUM INDUSTRY CO., LTD., one of the world's three largest tungsten wire manufacturers, it helps us to get filament with a longer lifespan and higher efficiency. Ceramic end base/cap can stand 1800℃ working temperature. We use different lead cables based on the practiced working temperature, some of them can be used under a higher temperature up to 750℃ for a long time. The quartz infrared emitter provided by Hefei Quickly Electric Co.,ltd can easily control the emitted wavelength and color temperature by adjusting the lamp’s filament temperature. Our IR lamps have been widely applied into PV solar industry, glass industry, plastic industry, powder coating industry...which helps us to get a rich experience ,knowledge and data to provide better service for our clients. Hefei Quickly 80% workers have a long working years - more than 10 years, they are skillful with lamp production,in this case, we can shorten our production period largely, for instance, we can finish 1000pcs IR lamps with 3 working days. 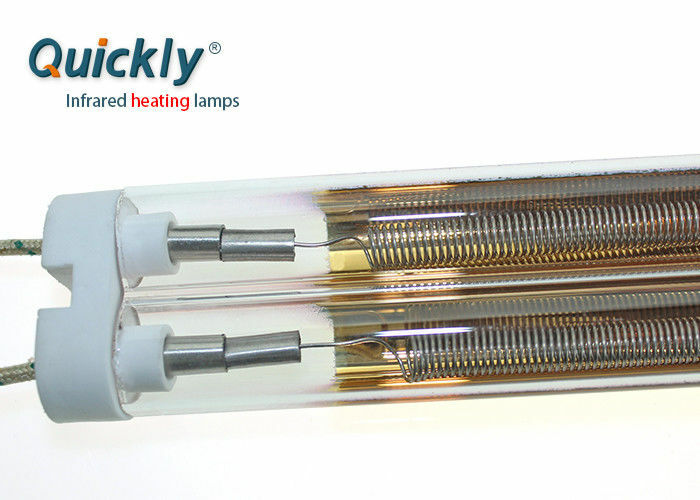 A: We are a professional factory of Infrared heater lamp. 2. How you do quality control? 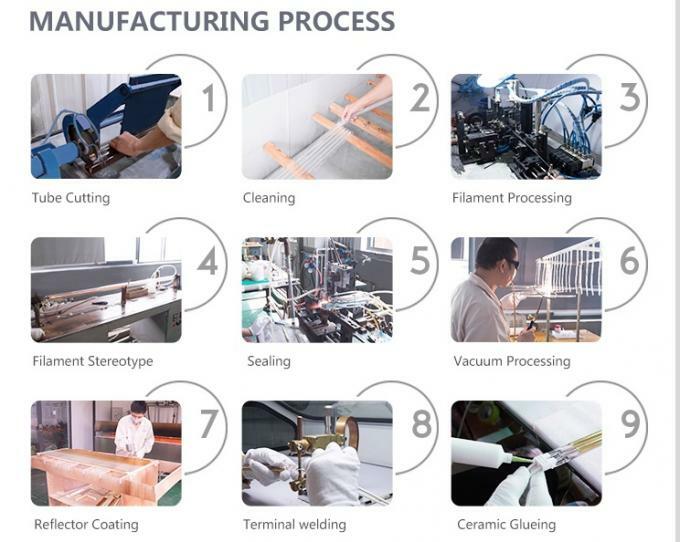 A: We have the most professional tech team and experienced workers, from material choosing,production process to final packing,all are under strictly control to make sure you can get the qualified quartz infrared emitters. 3. Are you a member of Alibaba Trade Assurance? A: Glad to tell you that we have joined the Trade Assurance on Alibaba to protect your payment to make sure that we delivery on time and manufacture quality infrared heater lamp as required. 5. How to protect your rights and interests? 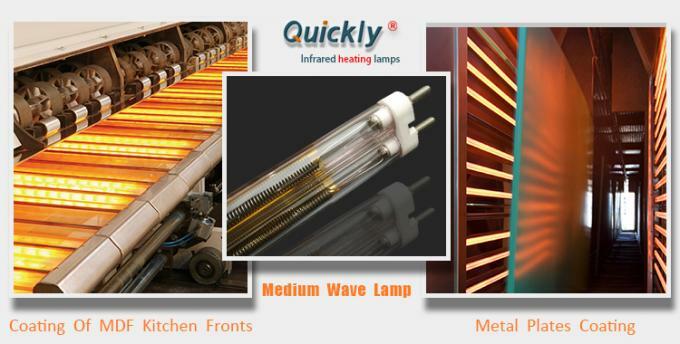 A: You can place orders for quartz heater lamps by Trade Assurance, a new service provided by Alibaba. They will be the third part to safe guarding your payment before you receive satisfied IR heat lamps in hands.